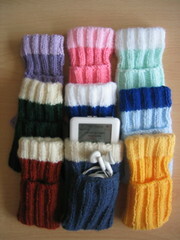 You might remember a while back that I blogged about my Mum knitting me iPod socks with a little pocket. Well, since then I bought a pair of earphones with a remote control and the whole thing, remote and earbuds, won't fit in the pocket. So Mum knitted me one with two pockets which does the job just nicely. I'm not the only one to love my iPod sock either. Mum's had a steady trickle of orders in through eBay and people seem to really love what she's doing. So now she's put up her own website, and is doing all sorts of colours and styles. She even does a really fluffy one with 'Eskimo' wool and is looking into doing one in Kevlar. She did get a reel of bonded Kevlar, but unfortunately it's impossible to knit with, and the supplier doesn't seem to be able to get their head round the concept of sending a reel of unbonded thread. If you have any ideas for other exotic threads she might use, let me know. Your mum’s iPod sock knitting inspired me to take up knitting and make my own! Thank you for blogging about it. Do you mind if I link to your blog when I post about knitting soon?